This is a novel that explodes with big themes worthy of debate; to enumerate all of them would constitute a spoiler. On the plus side that does make it slightly easier to do justice to the fascinating hour I spent in conversation with the author on publication day. 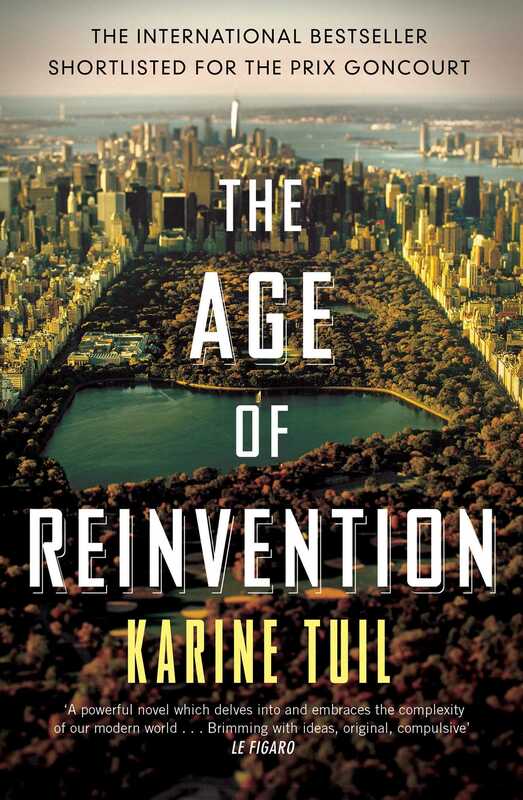 The Age of Reinvention is the story of a love triangle whose main focus is not so much the relationship as the fate of one of the men, Samir Tahar, who refuses to allow his humble origins in the Paris banlieue to stand in the way of big ambitions. In his desperation to overcome anti-Muslim prejudice at the outset of his legal career, he plays along with a convenient false assumption that he is in fact a North African Jew. The deception of a single moment rapidly escalates into the pervasive lie on which his personal reinvention in New York depends. Swapping his own past with that of Jewish college friend, Samuel Baron, proves an irresistible temptation for restyled big shot ‘Sam’, not the first he has succumbed to at the other’s expense. They have both loved stunning beauty Nina since their student days – her loyalties are unevenly divided. A complex set-up requiring various levels of investment and occasional suspension of disbelief on the reader’s part results in a tale that juxtaposes ambition and regret, deception and authenticity in a relentless series of switch-backs and reversals of role and fortune – this is a serious novel with the pace of a thriller and it definitely has plenty to ensnare an anglophone audience. Be warned – stylistic challenges are in evidence from the word go, with paragraphs running to several pages, lists of synonyms separated by slashes and numerous biographical footnotes on characters of no consequence, and yet, once attuned, it is a blend of form and content that somehow works. In our discussion Karine Tuil expressed some interesting views about literature: according to her there are novels which exist to entertain and novels which exist to ‘disturb’, the latter being her camp. A book should not give itself easily – she likes to make the reader an active participant rather than a simple consumer of content. She admits she’s out to get a reaction; to shock, even. No doubt about it – this novel is provocative, both in theme and characterisation. Having looked at thumbnails of her earlier books, it was clear to me that Karine Tuil is drawn to controversial subjects, which she readily confirmed, opining that the author should shun the comfort zone in favour of placing him- or herself ‘in danger’ – fighting talk, but hardly melodramatic given the material in question. Since this novel was published in France in 2013, much has happened to bring race relations, life in the troubled banlieue (well depicted here) and the radicalisation of disaffected youth to the fore, turning an unforgiving spotlight on France which casts a sinister glow well beyond its borders*. Even so, the extent of anti-Muslim discrimination depicted in this novel was so extreme that I ventured to ask Tuil if this reflects France as she sees it or if she had dramatised it for the sake of the story (which is allowed in fiction, after all). On the contrary, if anything she says she played it down. People’s perceptions of reality differ as do their politics and no doubt some in France would claim the opposite, but the reaction to this book, which has attracted far more attention than her previous work despite considerable acclaim (this was her fourth nomination for the Prix Goncourt, no less), is indicative of a substantial readership faced with a picture they recognise. But issues, however topical and important, do not make a novel, and Tuil acknowledges that the novelist’s only hope of tackling big social questions is by means of a good story on an intimate scale. I commented that she shows no hesitation in making her characters fallible and morally ambiguous and wondered if she sees this a risk or a necessity, a question I barely needed to ask but which led to a lively discussion in which we shared many views. She is fascinated by characters’ – and people’s – flaws and fragility and in aiming for a nuanced, as opposed to black-and-white, portrayal of character as any decent writer surely must, she withholds judgement. When I mentioned the eternal preoccupation with whether characters are ‘likeable’ in the English-speaking world, less apparent in French fiction, she was surprised – what’s interesting about that? The only significant sticking point for me lay in the portrayal of women and especially Nina. Tuil had already mentioned that in her writing women are often portrayed as submissive and ‘crushed by men’ and when I questioned this, she said she considers this too a realistic rendering. For much of the story I was agitated by Nina’s willingness to be manipulated and treated as possession or trophy by both men. Feminists will take some comfort in the point, albeit unpalatable, of women’s perceived worth being linked to their youth and physical attractiveness. That’s something all women have to contend with but a bigger issue still for the few like Nina who have been reduced to the single dimension of beauty on which society sees fit to slap a sell-by date. And there is much to say about the ending, which I cannot. The Age of Reinvention has left me impatient to read more from a writer who is herself uncrushable. Thank you very much to Karine Tuil for a great exchange of views and to Elizabeth Preston from Simon & Schuster for inviting me to meet her. * Note: this review was published 5 days before the terrorist attacks which took place in Paris on 13 November 2015. What a great review Isabel. So much said but only to entice not spoil on what sounds a very engaging story. Fantastic to hear the author’s thoughts via your interview too – her interest in character’s/people’s flaws & your quote stating ‘behaviour, predicaments and relationships held me rapt all the way’ make it a book very difficult not to want to read it.